James Dewey Watson, American biologist, won the Nobel Prize in 1962 for the discoveries he made in molecular genetics, along with Francis Crick and Maurice Wilkins. Watson was born on April 6, 1928, in Chicago, Illinois, and was declared a child prodigy at an early age. Indeed, in his youth, he appeared on a television program called "Chicago Quiz Show." Watson began his university studies at the age of fifteen at the University of Chicago, from which he graduated at nineteen. While in college, Watson was deeply affected by the writings of Erwin Schrodinger, who was among the first to articulate the concept of the gene. Watson received his doctoral degree in 1950 from Indiana University, after conducting research on bacterial viruses. After receiving his Ph.D., Watson won a fellowship from the Merck Foundation and spent a year furthering his study of bacterial viruses in Copenhagen, Denmark. From Copenhagen, Watson moved on to Cambridge University, where he first met and collaborated with Frances Crick, a young British biophysicist. In 1952, Watson and Crick began to investigate the molecular structure, and significance to genetics, of nucleic acids. The collaborators began by looking specifically at the earlier work done by Maurice Wilkins and Rosalind Franklin on X-ray crystallography analysis of deoxyribonucleic acid (DNA), a substance that was already considered to make genes, the fundamental units of heredity. Watson and Crick used Wilkins's and Franklin's data to create a three-dimensional model of the DNA molecule. Watson and Crick hoped that their model would agree with the chemical facts previously established about DNA; for example, that DNA consisted of phosphates, nitrogenous bases, and sugars. In addition, Wilkins's X-ray crystallography experiments had already determined many of the patterns by means of which such molecules were connected. Watson and Crick tried out various ways of arranging model molecules in space, finally settling on the aptly named "double helix." Their model, afterward referred to as the Watson-Crick model, showed DNA as a twostranded twisted "helix." The two strands consisted of complementary pairs of nucleotide units. This model both matched chemical facts previously known about DNA, and provided a viable explanation for how DNA could replicate, and thus for how genetic information could pass from one generation to the next generation of living organisms. Between 1956 and 1976, Watson ran a laboratory at Harvard University, where he also taught courses in biology. 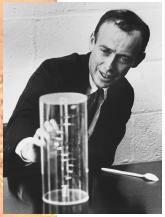 Additionally, in 1969 he was named director of the Cold Spring Harbor Laboratory in New York State. In 1991, Watson became the first director of the Human Genome Project, established by a consortium of public agencies to sequence the entire human genome, but he later resigned over the issue of patenting human genes. Among his notable publications are Molecular Biology of the Gene (1965) and The Double Helix (1968). Strathern, Paul. The Big Idea: Crick, Watson and DNA. New York: Anchor, 1997.